Last night, I went to see Happy Go Lucky, Mike Leigh’s new movie. It was excellent and not nearly as sombre as his other movies. If you have never seen a Mike Leigh movie, I recommend you check him out. He does plain, good cinema. Nothing fancy, just good script and good acting. The exams continue. I have had three more crying girls, two guys who wanted to shake my hand, two nervous breakdowns and have been informed of three bereavements, four broken bones and a cut hand. I have had depressingly few foreign nationals. Out of the 500+ students I will have examined by Saturday, there have been six who were truly musically talented. 1.2%. I have to admit that makes me feel sort of good about myself… but at the same time that means 98.8% of students I have heard have been unmusical in varying degrees. That is a lot of unmusic to listen to. 113 hours, actually. Gosh, I miss my knitting! 16 down, 2 days to go. Today, a girl burst into tears so suddenly and so violently my sight reading got wet. The tears literally squirted out of her eyes. Yesterday, another girl’s father came in to warn me that his daughter was going to cry. His certainty made me a little wary but sure enough, she entered howling and exited howling and howled through the whole darned lot. I am always surprised when people burst into tears, usually because they have been doing really well up to that point and are usually the type who do well overall in most things. I found three spiders on my person today: hair, arm, pen. (My pen has become an extension of my arm). The thought of my broken needle causes me physical pain but I’m bracing myself to relay the news that I switched back to my Addis. Sigh. They’re just not the same. It does take more than that to stop me, though, and now I have another problem: I have run out of yarn. I thought a chinese would help cheer me up last night but it appears that I now have the alimentary age of a ninety year old and have been reduced to mushy banans and mugs of tea. Still, could be worse. I could be allergic to tea or not grow so many spiders. Ich fuhle mich nicht wohl. I don’t feel very well. One row from completing the body of my Tangled Yoke cardigan, I managed to stand on one of my needles and break it in half. Words defy me although ‘another blow to my sanity’ comes close. 12 down, 6 days and 147 exams to go. I have started dreaming of islands where music was never invented. I wake each morning in the hope that I have contracted a highly infectious, non-life threatening disease like… mumps. Yeah. Mumps. Where all my glands swell up in my neck and I can’t hear a thing. Glorious, replenishing silence. I have had many encounters with spiders recently. I am as much of a fan of multiple legs running across my skin as the next person but I go out of my way to keep spiders alive. Creepy though they may be, they are very useful around the house. The evening before I left for work I brought in a load of washing from the line outside. By the time I got indoors, I had five tiny spiders hanging from my glasses. A few days ago, I came back from lunch and was halfway through an exam when a tiny spider lowered itself from my forehead. I blew it off my page only to have another abseil down off my glasses… and then another. The night before last, I was lying in bed reading my book when a very large hairy one slowly crept up over the top of my book (I’m sorry but not even I can help screaming in that situation). This morning I came in to find a sodden-looking spider floating in my jug of water. I fished him out with my finger to find he was still alive. I left him on the table cloth and periodically gave him a poke to make sure he was ok. He disappeared shortly before I finished for lunch. Am I giving off some sort of arachnid hormone or something? I have been knitting away. 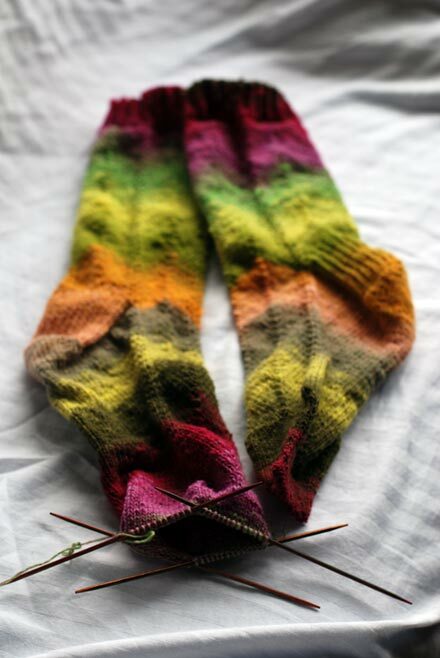 I finished my Noro socks but can’t sew up the last toe because I don’t have a darning needle with me! I’m happy with how they turned out, though, and the Harmony DPNs were really lovely to work with. I was working on my Coastlines top, the one with the lace yoke detail, but the silk has gotten completely and utterly knotted up in my handbag. I’ve left it to one side until I have sanity spare to deal with it. Just as well I packed something else, isn’t it? 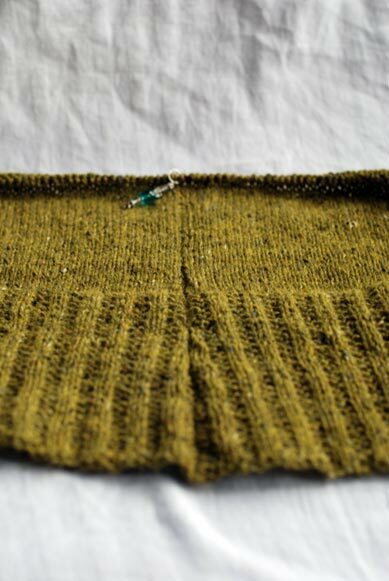 My Tangled Yoke cardigan was on the back burner for a while but the combination of my Harmony needles and not having anything else to knit has really kicked this off again! The needles really handle the Felted Tweed well – just the right amount of stickiness for wool. I have added a lot of length to it already and have just started the increases after the waist. I love the texture of the fabric. I’m finding it eggs me on to keep knitting. In fact, that’s what I’m going to do right now. 11 down, 7 to go. There’s really life outside work on your planet? I have been travelling for work. I am on day 9 of 18 consecutive days’ work… but who’s counting? I work periodically as a music examiner. This is the first time I have travelled for work and it’s been pretty interesting. I’ve seen nervous kids, happy kids, sad kids, worried kids, scared kids, ADD kids, bright kids, dim kids, big ones, small ones, tall gangly ones, ones blissfully unaware of what is really happening, ones with the soles of their shoes hanging off, ones in high heels, lots in their first communion shoes, a girl wearing Linx, and a six year old boy wearing aftershave. There have been sparkly shoes, sparkly jeans, sparkly tops, sparkly nails, sparkly eyeshadow, sparkly hairbands and sparkly hair. There have been anxious parents, pushy parents, late parents, early parents and the parents with four children under three who consider it a success to be there at any time. I have met crazy teachers, funny teachers, nice teachers who have brought me tea and biscuits, defensive teachers who insist on telling me their life story to reassure me that they’re worth a dime and friendly teachers who just want their students to do well. My days have been full of try it one more time, give it another shot, yes you can start again, have a guess, let’s try again, thank you, please, clap it back, sing it back, have a look at this, have a seat there, well done and good job! I have heard singers singing sharp, singing flat, singing funny words because they forgot the proper ones, singing so quietly that the birds outside the window are actually louder, singing so loudly that my ears throb. I have heard violins squeak, violas warble, double basses grunt, and clarinets honk louder than any horn, siren or duck I have ever heard. So far I have waited approximately 4 hours for public transport (Monday and Tuesday were bad days), been rained on three times, knitted two socks, had eleven conversations about the weather, drunk 27 cups of tea and coffee, 18 litres of water, eaten 3 illegal real biscuits and stolen a chocolate finger. 9 down, 9 to go. Dare I think ahead?